You first need to decide on a vehicle! What age, mileage, and cost are you willing to take on? Remember, the rule is not to spend more than 18% of your gross monthly income. So, if you are making $2000 a month, you should not spend more than $360 a month on your car payment. Buy what you can afford NOW, don’t stretch your budget. This will help you stay on top of things and build a better credit. Fill out our on-line credit application OR give us a call at 613-686-3962. You will need your 2 most recent pay-stubs, driver’s license, and the amount of your down payment. 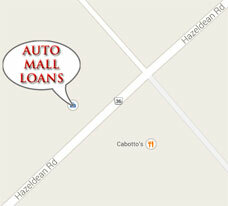 The higher your down payment, the better chance you have of getting a vehicle loan. Credit History will be gathered by our credit specialists. They will review it with you and explain all the pros and cons, and answer all your questions regarding your credit score. This is a FREE ONE-ON-ONE session with a qualified credit specialist and an opportunity for you to learn about your credit history. We highly recommend going through this process even if you don’t buy a vehicle from us at this time. This will help you gain insightful knowledge so that you are better prepared the next time you are looking for any type of loan. You may even end up passing on this knowledge to your loved ones so that they understand how to keep a positive credit history. Down payments do not have to be just cash. You can also trade in your current vehicle as a down payment. Remember, the more you are able to pay up front, the lower your monthly payments will be. Once you are happy with your used vehicle loan finance offer, we will prepare all the required paperwork to be signed by you. Once signed, all the paperwork will be forwarded to the designated lender. Before picking your vehicle you must ensure that you have insurance and must provide us a copy from your insurance company. Your vehicle will sent for emission testing and safety certification. It will be ready for you to pick up at your convenience!